The third annual Salt City Urban Art & Craft Market takes place Saturday, Oct. 22, from 10 a.m.-6 p.m. at King + King Architects, located at 358 W. Jefferson St. The Salt Market continues its mission to showcase Central New York’s outstanding contemporary artists, designers and crafters. Vendors will offer an eclectic variety of creative wares, clothing and jewelry, stationary, comics and original artwork. With help from the Near Westside Initiative, the Salt Market found a new home this year at King + King Architects. Located just outside Armory Square, the Salt Market will be held in the warehouse and along the raw loading dock. Food will be available from Syracuse favorites Strong Hearts Cafe, Roji Tea Lounge and Cafe Kubal. Local musicians will also provide entertainment. 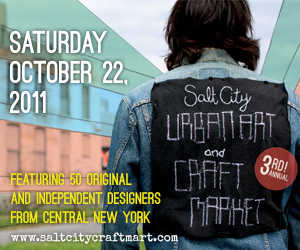 For more information about the Salt City Urban Art & Craft Market, contact Vanessa Rose at 917-680-6195 or visit http://www.saltcitycraftmart.com or email info@saltcitycraftmart.com.